Generalized EEG abnormalities typically signify dysfunction of the entire brain, although such dysfunction may not be symmetric in distribution. Generalized patterns thus may be described further as maximal in one region of the cerebrum (eg, frontal) or in one hemisphere compared to the other. Identification of an abnormality as generalized may require analysis of the EEG by several montages to determine lack of focal point. Careful elimination of external and bioelectric artifact is important to avoid misinterpretation of noncerebral activity (eg, ECG), which can contaminate multiple channels, appearing as generalized abnormalities. The normal background should have a number of defining characteristics. It should be symmetric with no significant difference in amplitudes on laterality, a posterior dominant rhythm (PDR) should be identifiable with a clear anterior to posterior gradient in admixtured frequencies, with faster frequencies anteriorly in the beta (13–17 Hz) range. Spontaneous variability and reactivity with stimulation or eye closure/opening should be present. It also should be continuous without periods of suppression or attenuation (brief periods of very low amplitudes < 10µV). Adults should have a posterior dominant rhythm between 8 and11 Hz. In children, normal background frequencies are around 4 Hz in the infant and becomes faster throughout childhood, reaching 8 Hz by age 3 years, and the average adult frequency of 10 Hz by 10 years of age. Background slowing is present when the identifiable PDR is slower than the lower limit for the patient's age. See the image below. A typical example of background slowing, which is nonspecific but often due to an underlying neurocognitive disorder or effect of sedating medications. This is a typical example of generalized intermittent slowing. 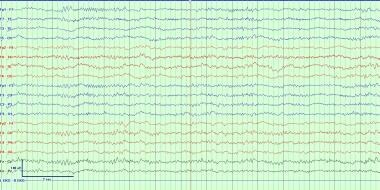 This is a very nonspecific EEG waveform abnormality that can be due to a wide variety of causes, most commonly as an effect of sedating medications, toxic metabolic derangements, or an underlying neurocognitive disorder. This is most often seen as polymorphic delta and/or theta activity which, in adults, is most often frontally predominant. Intermittent rhythmic delta activity (IRDA) usually occurs at frequencies of 2–2.5 Hz with relatively sinusoidal, stereotypic, bilaterally synchronous waveforms appearing in short bursts. The ascending phase is sloped more steeply than the descent, and waves are typically bilateral and widespread with peak amplitude frontally in older individuals (FIRDA) and occipitally in children (OIRDA). These patterns attenuate with alerting or eye opening. Eye closure, drowsiness, and hyperventilation accentuate IRDA. Although IRDA disappears in stage 2 and deeper non-rapid eye movement (REM) sleep, it may reappear in REM sleep. See image below. Multiple etiologies can result in IRDA, including metabolic, toxic, hypoxic, or various diffuse or focal intracranial diseases. Even when IRDA occurs unilaterally in association with a focal cerebral lesion, the lateralization of IRDA may be ipsilateral or contralateral to the lesion. Thus, IRDA is a nonspecific nonlocalizing EEG pattern, unless associated with other focal findings on the EEG. Although the mechanisms for production of IRDA are understood incompletely, studies correlating with pathologic specimens suggest that IRDA is associated primarily with diffuse gray matter disease. The degree of encephalopathy manifested appears to correspond to the proportion of IRDA on the EEG. This pattern must be distinguished from the frequently encountered frontally maximal intermittent delta that can be seen in drowsy elderly patients. This is an example of intermittent generalized rhythmic delta activity (GRDA) which in adults is most often frontally predominant. In children it is more often occipital predominant. This pattern is often seen with many causes of encephalopathy and is nonspecific, however it can reflect cortical irritability or propensity to evolve into an electrographic seizure in rare circumstances. Diffuse or anteriorly prominent theta and delta patterns occur in comatose and encephalopathic states of multiple potential etiologies. Patterns that fail to respond, either in amplitude or frequency, to noxious, auditory, or visual stimuli carry a poor prognosis for meaningful neurologic recovery if not due to anesthetic medications. Similar patterns with preserved reproducible reactivity imply potential for some recovery and should be compared to recordings repeated several days later. These patterns must be distinguished from those of normal drowsiness and sleep. This is a typical example of generalized continuous slowing. This reflects moderate to severe diffuse cerebral dysfunction, but similar to other general EEG waveform abnormalities, it has a wide variety of causes. These can include a post-ictal state following a generalized seizure, effects of powerful sedating medications like anesthetics such as Propofol or midazolam, or it can reflect a static encephalopathy from significant developmental delay or major diffuse brain injury such as anoxic brain injury or diffuse axonal injury. Caution must be used when interpreting EEG waveform patterns with continuous slowing so as to not miss the presence of sleep structures that would identify a sleep pattern. An example of alpha coma. The patient is unresponsive with continuous alpha activity throughout. Note the lack of anterior to posterior gradient and lack of reactivity in the EEG with stimulation from the EEG technician noted in the recording. This pattern must be continuous throughout space and time. Alpha coma. This 29-year-old man sustained a closed head injury in an automobile accident. The patient was on a respirator, was deeply comatose, and responded to painful stimulation with decerebrate posturing. Later, he improved to a neurovegetative state. He could open his eyes and could breathe without the respirator, but he could not follow commands and made no purposeful movements. The EEG at 1 week contains high-voltage frontally predominant relentless alpha activity that was minimally responsive when stimulated. In this patient, reactivity did not suggest a good prognosis. Spindle coma is similar in appearance and implications but consists of monorhythmic 11- to 14-Hz activities, occurring paroxysmally on a delta background, without reactivity. Such patterns often are seen in anoxia, head trauma, and diffuse cerebral insults. Prognosis is usually that of the underlying etiology, although reactivity portends a better prognosis than unreactivity on these EEGs. This pattern must be distinguished from normal alpha rhythm in the locked-in state and from slower segments of 10- to 18-Hz rhythms observed in various intoxications. Both alpha coma and spindle coma must be distributed throughout space (see the image below). An example of spindle coma in a ventilated unresponsive patient. Note diffuse spindles in all leads with the absence of anterior-posterior gradient. Other normal sleep structures including K complexes are absent and this patient is unresponsive to stimulation off sedation elsewhere in the recording. To be present this pattern must be continuous throughout space and time. This is a typical burst suppression pattern. This reflects severe diffuse cerebral dysfunction and is generally seen with comatose patients that are minimally reactive to stimuli. This pattern can be seen with powerful sedating anesthetics such as Propofol, midazolam, or phenobarbital. It also can be seen after severe insults such as high grade subarachnoid hemorrhage and anoxic brain injury. Generalized periodic discharges occurring in short trains at about 1 Hz frequency. These can be seen with a wide variety of conditions, most often occurring with severe toxic metabolic derangements. They reflect cortical irritability and can occasionally evolve into seizures or status epilepticus. Treating the underlying toxic and/or metabolic derangement causes resolution of the discharges in most cases. 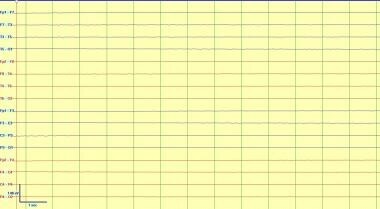 Some waveforms with these periodic discharges can be more concerning for an ictal pattern. Typically GPDs occurring at a frequency greater than 2.5 Hz are concerning for seizure (see the image below). This pattern exemplifies generalized periodic discharges (GPDs) and can be considered potentially ictal. This 54-year-old patient was seen 5 days after a coronary artery bypass complicated by a prolonged hypotension causing diffuse cerebral anoxia. The patient is deeply comatose and unresponsive to any stimulation. He has occasional episodes of rapid eye blinking. The EEG has high-voltage bursts of spikes lasting for less than 1 sec followed by low-voltage attenuation. This type of abnormality can be associated with anoxic encephalopathy and when present carries a poor prognosis. A typical exam of background suppression/attenuation with all activity at less than 10 microvolts. This is most often due to drug-induced coma from supratherapeutic infusions of anesthetics or very severe anoxic brain injury. Artifact frequently obscures part of the EEG recording in many situations due to sweat, pulse wave, or the ICU environment which can generate significant electrical artifacts from ventilators or other devices. Subacute sclerosing panencephalitis (SSPE) is an inflammatory disease of children and adolescents caused by chronic infection with the measles virus. The characteristic EEG pattern, initially described by Radermecker and Cobb and Hill, consists of high-voltage (300–1500 µV), repetitive, polyphasic sharp and slow wave complexes of 0.5- to 2-second duration that recur every 4–15 seconds. [15, 16] Rarely, the complexes can occur at intervals of 1–5 minutes. The interval between complexes may shorten as the disease progresses. The morphology of the waveforms tends to be consistent in a single recording but may be strikingly variable with disease progression. Although the complexes are usually symmetric and synchronous, they may be asymmetric with a time lag between hemispheres or lobes. The EEG usually is not changed by stimuli except in the earliest stages of the disease or in remission, when the EEG pattern tends to be more inconstant. The EEG background is slow and progressively more disorganized as the disease advances. The stages of sleep eventually become difficult to distinguish. Abnormal movements, cognitive deterioration, and the diagnostic EEG characterize the clinical disease. Stereotypic jerking or other movement abnormalities occur with the periodic complexes. Rarely, the periodic complexes become apparent before the movements manifest. The movements often disappear in sleep, even though the complexes persist. See the image below. Subacute sclerosing panencephalitis. This is a 7-year-old boy who is comatose and having myoclonic jerks. The onset of the illness began 14 months ago with deterioration of intellectual function and he has become progressively unresponsive. This EEG shows stereotyped high-voltage (300-400 mV) bursts of activity every 4-6 seconds. Myoclonic jerks often occur in association with the sharp waveforms, but the relationship is not constant. 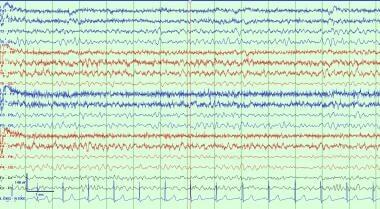 Late in the illness and during sleep, myoclonic jerks disappear, despite the persistence of the periodic EEG. The sharp waves typically react to external stimuli. Early in the disease, alerting the patient may elicit the periodic pattern; later, when the periodic pattern is readily apparent, rhythmic photic or other stimuli can "drive" the periodic frequency. Benzodiazepines or barbiturates can temporarily eliminate both myoclonic jerks and periodic patterns. Creutzfeldt-Jakob disease. This is a 56-year-old female professor who became more withdrawn and increasingly forgetful. Over the next 4 months she deteriorated rapidly and became mute, bedridden, and unable to eat with myoclonic jerks of her arms. 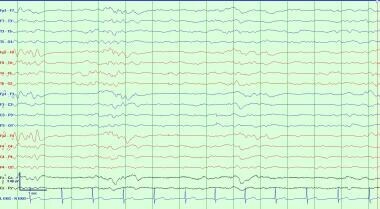 The EEG done 6 months into her illness shows a pseudoperiodic, well-organized 1- to 2-Hz biphasic and triphasic waves and very little other activity. In this clinical setting, this EEG is virtually pathognomonic of Creutzfeldt-Jakob disease and is regarded as a manifestation of severe gray matter disease involving the cortex and deep nuclei. EEGs are performed occasionally to provide supportive evidence of brain death. Although brain death is defined by clinical criteria, some situations preclude complete or definitive examination findings (such as severe open head or eye trauma). In such situations, a confirmatory test is often helpful. Cerebral angiography demonstrating no blood flow is the most sensitive and specific confirmatory test, but it also is time and labor intensive and may be refused by the family as it is highly invasive. An EEG may be a reasonable alternative, but it needs to be performed according to strict criteria for clinical as well as medical-legal determinations. Electrocerebral inactivity (ECI), or electrocerebral silence (ECS), is defined as no cerebral activity over 2 µV using a montage that uses electrode pairs at least 10 cm apart with interelectrode impedances < 10,000 ohms and >100 ohms. See image below. This is an example of electrocerebral inactivity or silence. This demonstrates absence of cerebral electrical activity, which can be seen with supratherapeutic doses of powerful anesthetics or in a proper clinical context can be consistent with brain death. Note that brain stem activity is not measured with EEG, and it may be possible in rare situations for brainstem reflexes to be intact with absence of higher cortical activity. 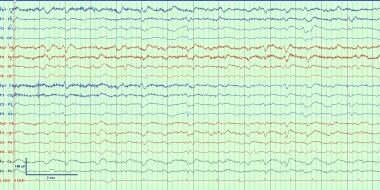 What are generalized EEG waveform abnormalities? What is background slowing on EEG? 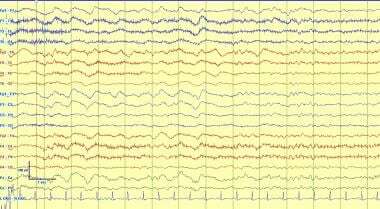 What is intermittent slowing on EEG? 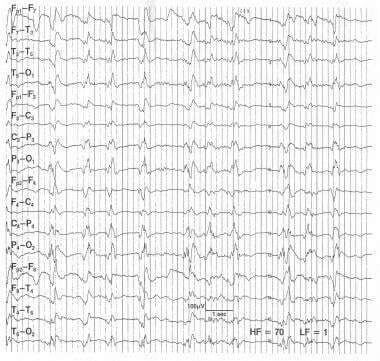 What is intermittent rhythmic delta activity on EEG? 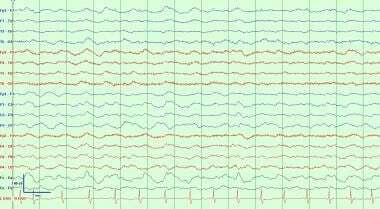 What is diffuse slowing on EEG? 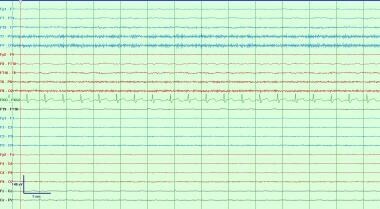 What is an alpha coma on EEG? What is burst suppression on EEG? What are periodic discharges on EEG? What is background suppression on EEG? Which findings on EEG are characteristic of subacute sclerosing panencephalitis (SSPE)? Which findings on EEG are characteristic of Creutzfeldt-Jakob disease? How is EEG used to confirm brain death? How is electrocerebral inactivity defined on EEG? What are the ACNS minimum technical standards for EEG recording in suspected brain death? Daly DD. Use of EEG for diagnosis and evaluation of epileptic seizures and nonepileptic episodic disorders. In: Klass DD, Daly DD, eds. Current Practice of Clinical Electroencephalography. Raven Press. 1979:221-268. Hirsch LJ. Classification of EEG patterns in patients with impaired consciousness. Epilepsia. 2011 Oct. 52 Suppl 8:21-4. [Medline]. Hirsch LJ, LaRoche SM, Gaspard N, Gerard E, Svoronos A, Herman ST, et al. American Clinical Neurophysiology Society's Standardized Critical Care EEG Terminology: 2012 version. J Clin Neurophysiol. 2013 Feb. 30 (1):1-27. [Medline]. Abou-Khalil B, Misulis KE. Atlas of EEG & Seizure Semiology. Philidelphia: Elsevier; 2004. Motomura E, Inui K, Ohoyama K, Nishimura Y, Nakagawa M, Maeda M, et al. Electroencephalographic Dipole Source Modeling of Frontal Intermittent Rhythmic Delta Activity. Neuropsychobiology. 2012 Jan 17. 65(2):103-108. [Medline]. Sharborough FW, Westmoreland BF, Reagan TJ, et al. The significance of transitional monorhythmic EEG pattern in patients after cardiopulmonary arrest. Neurology. 1975. 27:384-385. Kaplan PW. The EEG in metabolic encephalopathy and coma. J Clin Neurophysiol. 2004 Sep-Oct. 21(5):307-18. [Medline]. Austin EJ, Wilkus RJ, Longstreth WT. Etiology and prognosis of alpha coma. Neurology. 1988 May. 38(5):773-7. [Medline]. Westmoreland BF, Klass DW, Sharbrough FW, Reagan TJ. Alpha-coma. Electroencephalographic, clinical, pathologic, and etiologic correlations. Arch Neurol. 1975 Nov. 32(11):713-8. [Medline]. Synek VM, Glasgow GL. Recovery from alpha coma after decompression sickness complicated by spinal cord lesions at cervical and midthoracic levels. Electroencephalogr Clin Neurophysiol. 1985 May. 60(5):417-9. [Medline]. 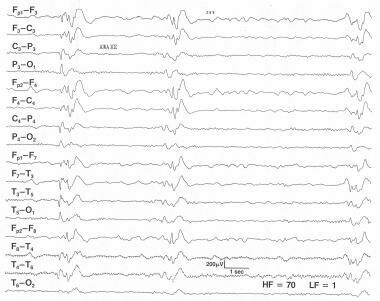 Chokroverty S. "Alpha-like" rhythms in electroencephalograms in coma after cardiac arrest. Neurology. 1975 Jul. 25(7):655-63. [Medline]. 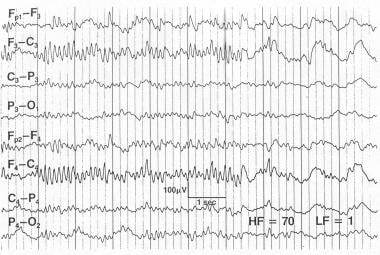 Seneviratne U, Cook M, D'Souza W. The electroencephalogram of idiopathic generalized epilepsy. Epilepsia. 2012 Feb. 53(2):234-48. [Medline]. Hirsch LJ, Claassen J, Mayer SA, Emerson RG. Stimulus-induced rhythmic, periodic, or ictal discharges (SIRPIDs): a common EEG phenomenon in the critically ill. Epilepsia. 2004 Feb. 45(2):109-23. [Medline]. Radermecker J. Aspects electroencephalographiques dans trois cas d'encephalite subaigue. Acta Neurol Psychiatr Belg. 1949. 49:222-232. 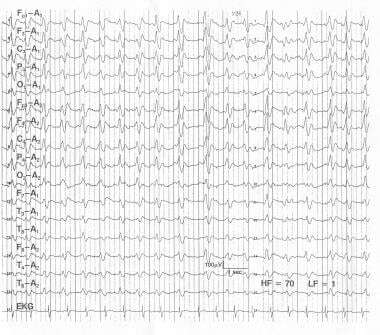 Cobb W, Hill D. Electroencephalogram in subacute progressive encephalitis. Brain. 1950. 73(3):392-404. [Medline]. Westmoreland BF, Gomez MR, Blume WT. Activation of periodic complexes of subacute sclerosing panencephalitis by sleep. Ann Neurol. 1977 Feb. 1(2):185-7. [Medline]. Markand ON, Panszi JG. The electroencephalogram in subacute sclerosing panencephalitis. Arch Neurol. 1975 Nov. 32(11):719-26. [Medline]. Cobb W. The periodic events of subacute sclerosing leucoencephalitis. Electroencephalogr Clin Neurophysiol. 1966 Sep. 21(3):278-94. [Medline]. Jones DP, Nevin S. Rapidly progressive cerebral degeneration (subacute vascular encephalopathy) with mental disorder, focal disturbances, and myoclonic epilepsy. J Neurol Neurosurg Psychiatry. 1954 May. 17(2):148-59. [Medline]. Gao C, Shi Q, Tian C, Chen C, Han J, Zhou W, et al. The epidemiological, clinical, and laboratory features of sporadic Creutzfeldt-Jakob disease patients in China: surveillance data from 2006 to 2010. PLoS One. 2011. 6(8):e24231. [Medline]. [Full Text]. American Electroencephalographic Society. Guideline three: minimum technical standards for EEG recording in suspected cerebral death. American Electroencephalographic Society. J Clin Neurophysiol. 1994 Jan. 11(1):10-3. [Medline]. Gloor P. Generalized and widespread bilateral paroxysmal activities. In: Cobb W, ed. EEG Interpretation in Clinical Medicine. Handbook of Electroencephalography and Clinical Neurology. Vol 11. Elsevier Science. 1976:52-87. Grindal AB, Suter C. "Alpha-pattern coma" in high voltage electrical injury. Electroencephalogr Clin Neurophysiol. 1975 May. 38(5):521-6. [Medline]. Petre-Quadens O, Sfaello Z, Van Bogaert L, Moya G. Sleep study in SSPE (first results). Neurology. 1968 Jan. 18(1 Pt 2):60-8. [Medline]. Diffusely slow EEG in severe subarachnoid hemorrhage. The patient had a sudden onset of the worst headache of his life associated with vomiting. The headache was followed shortly by a convulsion and coma. The CT scan showed an anterior communicating aneurysm and subarachnoid and intraventricular blood. The patient is deeply comatose. The EEG is diffusely slow, with no normal activity. The patient died the next day, without regaining consciousness. 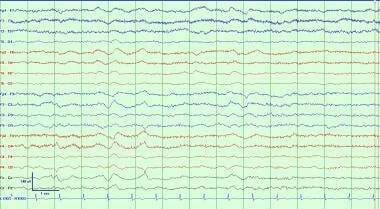 Encephalopathic EEG patterns in uremia. This 76-year-old woman has a history of dementia and uremia. She has been stuporous for one week, and her BUN is 88. The patient is difficult to arouse, but she is able to answer simple "yes/no" questions and follow a few simple commands. The EEG shows continuous theta and delta activity. Auditory stimulation results in a reduction in voltage and a decrease in amount of delta. Spindle coma. This 14-year-old male patient suffered a closed head injury. At the time of the EEG (3 d after the injury) the patient was comatose, but respirations were spontaneous and he responded appropriately to painful stimulation. There is a generalized high-voltage delta activity with sleep spindles superimposed. The spindles are more widespread than normal sleep spindles, although they are of similar morphology. The patient gradually improved to normal neurologic function. This is a typical example of generalized continuous slowing. This reflects moderate to severe diffuse encephalopathy, but similar to other general EEG waveform abnormalities, it has a wide variety of causes. These can include a post-ictal state following a generalized seizure, effects of powerful sedating medications like anesthetics such as Propofol or midazolam, or it can reflect a static encephalopathy from significant developmental delay or major very diffuse brain injury such as anoxic brain injury or diffuse axonal injury. Caution must be used when interpreting EEG waveform patterns with continuous slowing so as to not miss the presence of sleep structures that would identify a sleep pattern.